Woot, I’ve made it past the halfway point for this week! Something to celebrate, right? I feel like I’m dragging this week partly due to being gypped last weekend stuck inside with yucky weather. I’m bad when stuck inside, I always feel a drive to be productive and make the most of the time tackling house projects and not relaxing. And I’m just craving warm weather, sunshine and a change of scenery here hoping this weekend will be nice for some sort of outdoor activity. I woke up this morning with my insides on the fritz. Not totally sure why, maybe a couple of days of maca powder in my smoothies is catching up to me or too many raw veggies for dinner last night, maybe stress and the weather. Either way, I was not a happy camper and decided to take it a bit easy today and give my digestive system a rest. Breakfast was my usual green monster smoothie with hemp protein powder, sprouts, mixed greens, carrot and two small oranges. I added more water to make it less gloppy and easier to drink. I sipped a Kombucha at my desk right before lunch and it really did sooth my stomach taming the, uh, anger. 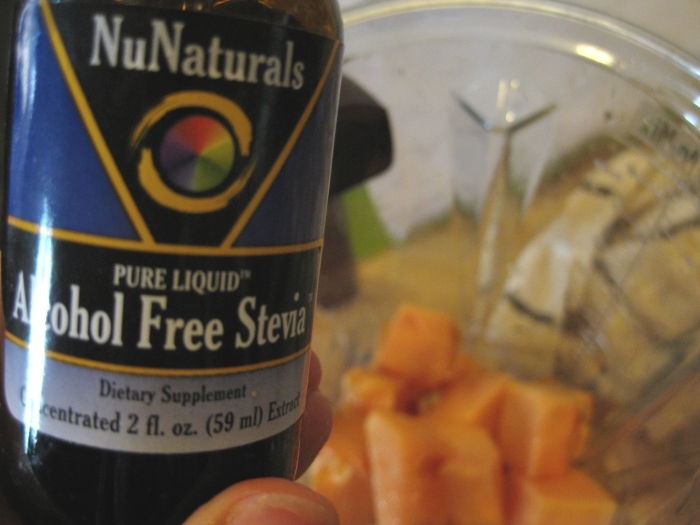 I could see it being helpful during a juice detox – not that I’m planning to try one anytime soon! 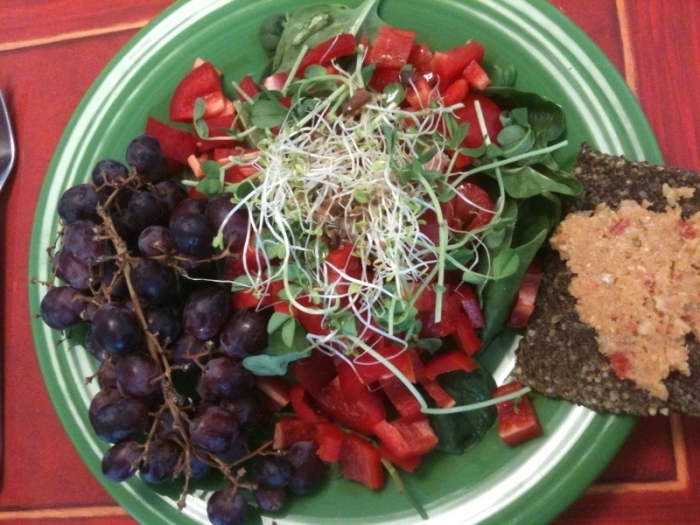 For lunch I did a simple salad of spinach, red bell pepper, sprouts and Annie’s Organic Shitake dressing with a piece of hemp seed bread and cashew cheese and grapes. Filling, but not bloating or too intensive to digest. That didn’t hold me and I ended up snacking on the small apple and orange I packed for emergency snacks in the afternoon. 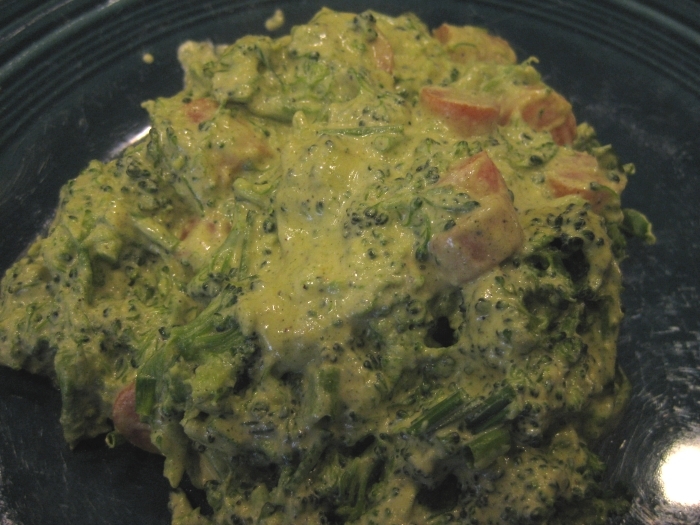 I tried to keep dinner simple as well and as much as I love raw broccoli, it can be tough when you’re digestive system is not feeling 100% and I was craving something warm, so I created a steamed broccoli and carrot dish with a creamy hemp seed/zucchini sauce. On my last shopping trip to Trader Joe’s, I impulsed bought this. 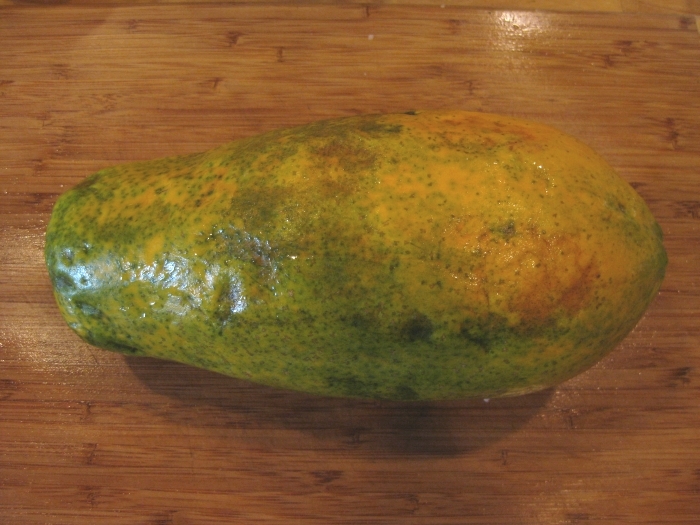 A papaya. I like dried papaya, but the store bought stuff is typically waxy and too chewy, lacking in flavor. So I decided to experiment with this one to create dried papaya squares. 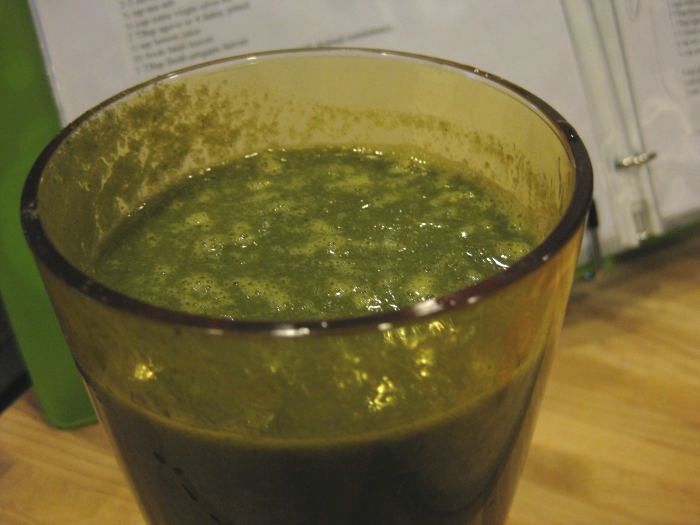 Blend all ingredients in a blender to a smooth puree. 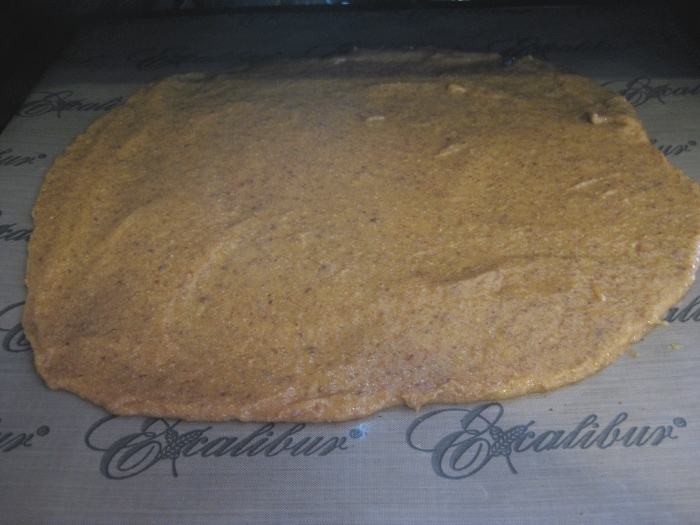 Spread mixture onto a nonstick dehydrator sheet and dry on one side for 2 hours at 115 degrees. 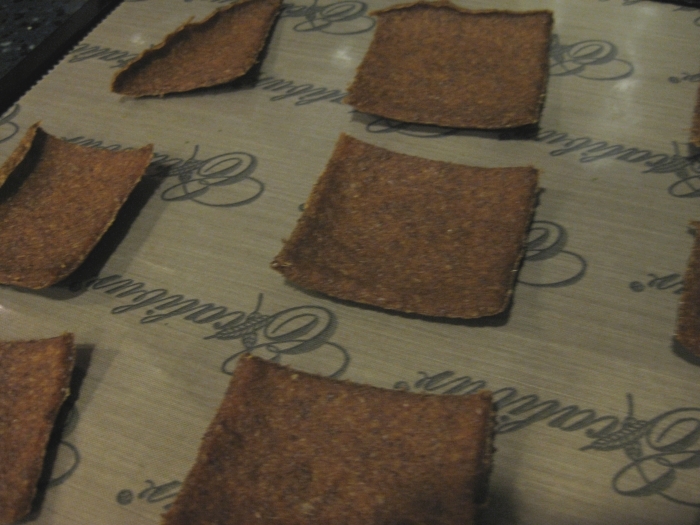 Flip, slice into squares with a pizza cutter and dehydrate for another 2 hours. 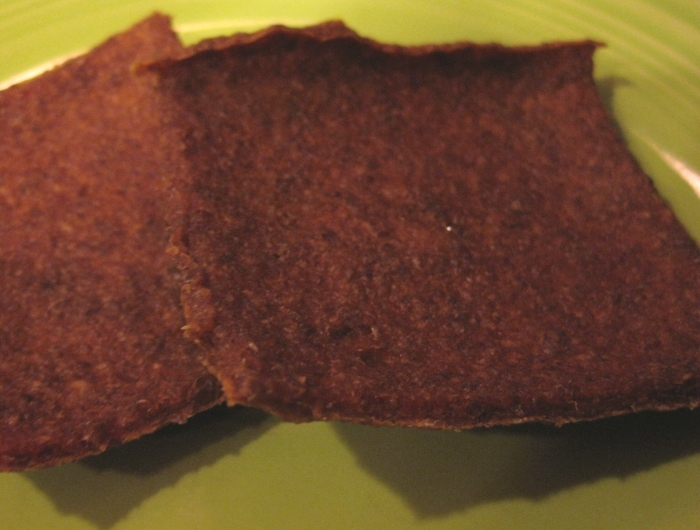 Dehydrate longer if crunchier texture is desired. They were good, soft and moist, but still held together nicely and weren’t overly sweet – but still sweeter than store bought dried papaya. Being pureed with flax seeds makes them much easier to eat, not overly chewy at all. 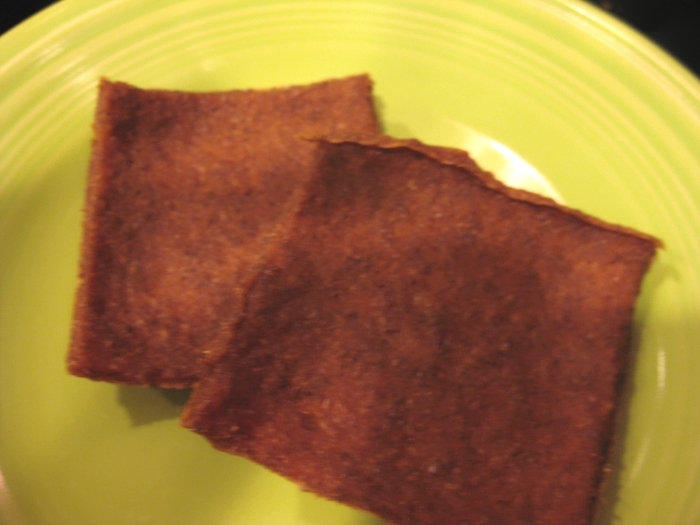 It’s a simple healthy snack that does not require too much time to dehydrate. That broccoli dish DOES look creamy– yum! You know, papaya is the ONLY food that I don’t like! Literally, the only one! I hope you feel better soon – and hope you get some sunshine! I’m sorry to hear that your tummy has been upset. Hope you’re feeling better now. 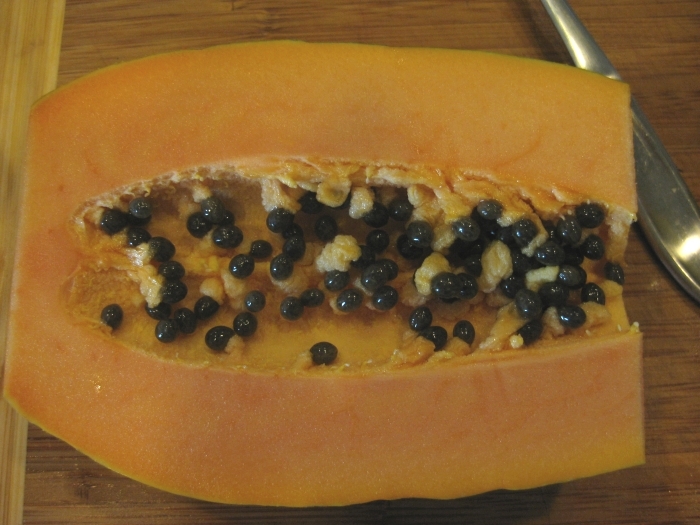 Papaya is a great fruit. It always makes me dream of summer ;). my insides are not feeling so hot either today…..have not felt right since last night. your food looks delish too. 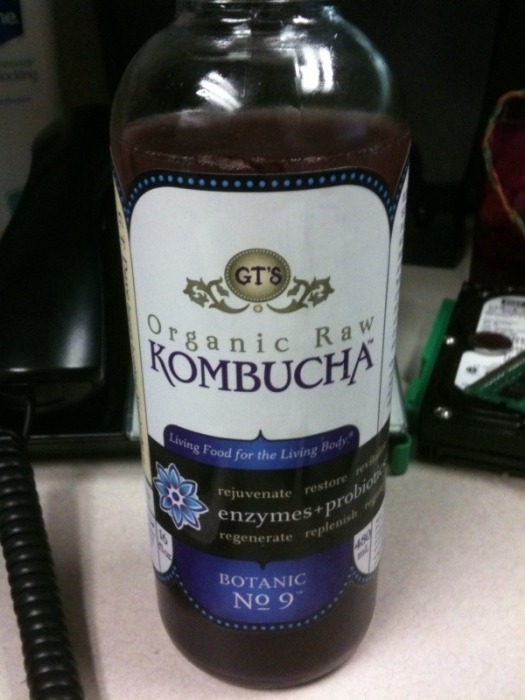 i think a kombucha would help my tummy-too bad i don’t have one. gosh i hope you get good weather this weekend! great job! and it’s got so many great enzymes for digestion and gut health too! I wish I had a dehydrator!